Game two of the double header went into the seventh and final scheduled inning in a scoreless tie. Nolan Gorman led off against reliever Chester Pimentel and launched his Midwest League leading fourth homer of the season off the batters eye in center field. The blast, his second of the series, also makes him the MWL leader in RBI (13), hits (15), slugging (.838), OPS (1.310), total bases (33), runs scored (10) and extra-base hits (9) through 10 games. 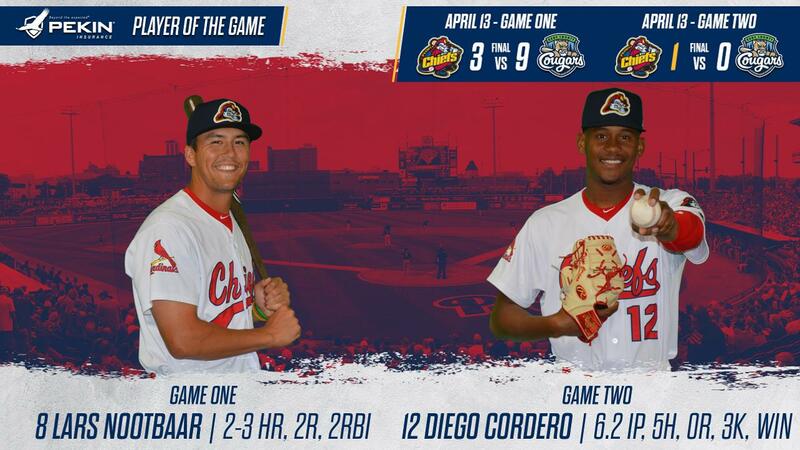 With the Chiefs on top 1-0, starting pitcher Diego Cordero went back to the mound. Alek Thomas led off the seventh with a fly ball to shallow left field. Shortstop Delvin Perez attempted to make an over-the-shoulder catch but the ball dropped in. Left fielder Lars Nootbaar picked up the ball and fired to second to get Thomas for the first out. Eddie Hernandez walked and Logan Tolbert singled to right but Leandro Cedeno racked up another outfield assist as he threw a strike to Perez at second base. With Hernandez as the tying run at third, Sebastian Tabata took over on the mound to make his season debut. He nailed down the save with one pitch as David Garza grounded out back to the mound to end the game. Cordero (1-1) earned the win as he allowed five hits over 6 2/3 shutout innings. Cordero walked two and struck out three. Tabata earned his first save of the season with a one-pitch outing. Game one went to the Cougars 9-3 as the hosts scored four in the first inning and three in the third. The Chiefs got on the board against Justin Vernia in the second inning. Nootbaar and Ivan Herrera collected consecutive singles to put runners on the corners and a double play ball cut the Cougars lead to 4-1. Trailing 9-1, the Chiefs scored the final two runs in the sixth inning. With two down, Cedeno singled to left and Nootbaar greeted reliever Ryan Miller with a long two-run homer to right field, his third of the young season. Aker (0-1) took the loss as he allowed nine runs on five hits over 3 1/3 innings as he walked four and struck out four. Noel De Jesus allowed one hit and struck out two over 2 2/3 shutout innings. The Chiefs have the day off Sunday after playing two games on Saturday. nbaliva@gmail.com This story was not subject to the approval of the National Association of Professional Baseball Leagues or its clubs.